Abstract: Several novel phase-modulated fiber optic links for analog or microwave signal transport up to at least 20 GHz frequency are theoretically developed and experimentally demonstrated. Each link uses a linearization technique exploiting the Lithium Niobate modulator's electro-optic anisotropy between orthogonal crystallographic axes that has not previously been applied to phase-modulated links. This technique and its variants suppress the dominant third-order distortion product to extend the sub-octave spur-free dynamic range of the systems, and does so passively using the modulator instead of with processing at the receiver. Two of the links incorporate frequency downconversion, with one of them employing a new method to spectrally filter the local oscillator and signal sidebands together. This both downconverts the signal to an appropriate intermediate frequency and causes the phase modulation to appear as intensity modulation for photodetection with a low-speed detector. 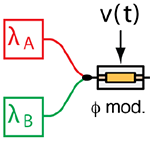 This technique does not require a separate optical oscillator source and can be implemented with commercial hardware.